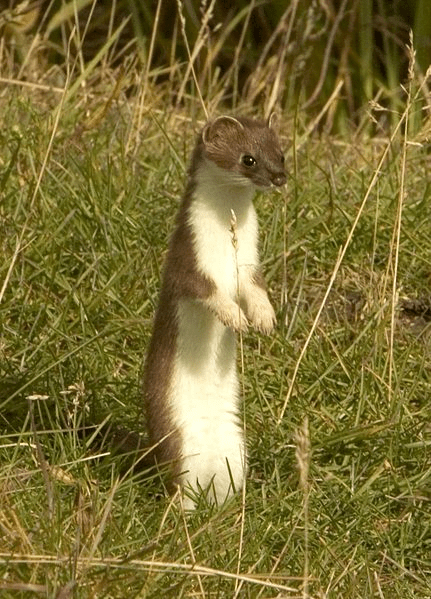 Pound for pound the stoat is one of Ireland’s most formidable predators. At only 16cm to 31cm (6 to 12 inches) long and weighing in at between 90g and 445g (3 and 15½oz) this fearsome little carnivore will readily take on prey two or more times its own size. Considered to be the most widespread member of the mustelid or weasel family, stoats are common throughout Ireland, and are often referred to here as weasels (the true weasel being absent from this country). Stoats are long, slender-bodied animals with a longish, black-tipped tail. For most of the year the fur is chestnut or red-brown colour above with a cream or white underside. In winter some stoats turn completely white except for the tip of the tail, which remains black. White stoats are said to be in “ermine”, and in the past were trapped for their skins when in this state. Stoats will readily live in any habitat at any altitude as long as there is sufficient food and ground cover. They feed mainly on rodents like field mice, rats and especially rabbits – despite the latter two being substantially larger and heavier than an adult stoat. When food is hard to come by stoat’s will supplement their diet with birds’ eggs, fruit and will even take invertebrates like earthworms. They tend to dislike being out in the open and hunt for prey along hedgerows, ditches and verges or through the ample cover of meadowland and marshes. Excellent hearing, sight and sense of smell help stoats to find and stalk their prey, which is normally killed with a single powerful bite to the back of the neck. Male and female stoats live separate lives, both sexes maintain territories, and like other mustelids use scent to clearly mark out the boundaries. They defend their territories against other stoats, but during the breeding season males abandon their territorial system and roam freely in search of a mate. Each stoat will typically have a number of dens within its territory, and will move between them periodically. Dens are typically situated in a suitably sized hollow or crevice, and in colder climates are sometimes lined with rodent fur for insulation. Sometimes the empty nest of former prey will be used as a den. Despite the fact that mating usually takes place in early summer, female stoats do not give birth until the following spring, as implantation of the fertilised egg is delayed for 9-10 months before the four week gestation. A female stoat will typically bear between six and twelve young, known as “kits”. They are blind and deaf at birth and have hardly any fur. Kits are weaned at about five weeks, and are fully independent and able to hunt for themselves after about twelve weeks. Food shortage is the biggest threat to young stoats, and mortality in the first year is high, with many youngsters unable to find enough food through the winter months. Other threats are owls, hawks and any larger carnivores they encounter. Although they were at one time persecuted by game keepers and poultry farmers, stoats are now protected by law in Ireland and it is illegal to trap, injure or disturb them in any way.